I love homemade ornmaments on a tree. Today, I have some easy ones to make using cookie cutters. I used metal painted cookie cutters from Wilton as my base but any type will work. 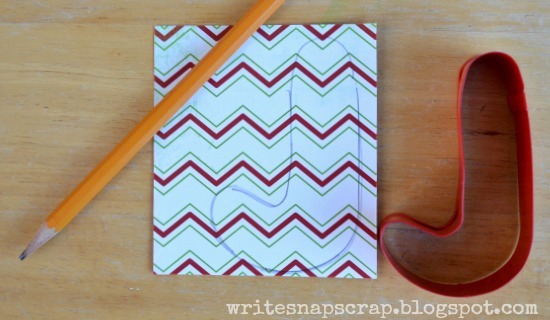 Start by tracing the cookie cutter on patterned paper. I used Bo Bunny's Mistletoe collection, which was included in the December kit at My Creative Scrapbook. 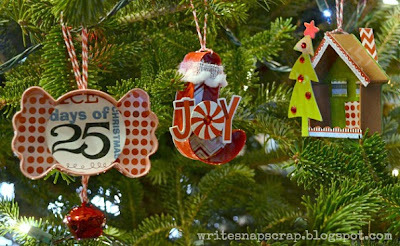 I dut out the shape then used a glue medium to attach it to the back of the ornament. 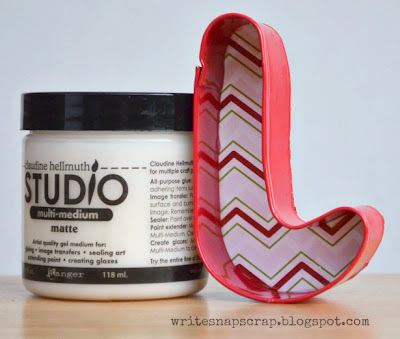 I'm partial to Claudine Hellmuth's multi-medium matte. Decorate as desired. This cookie cutter was meant to be a candy cane, but I liked it better as a stocking. Artistic license and all that! 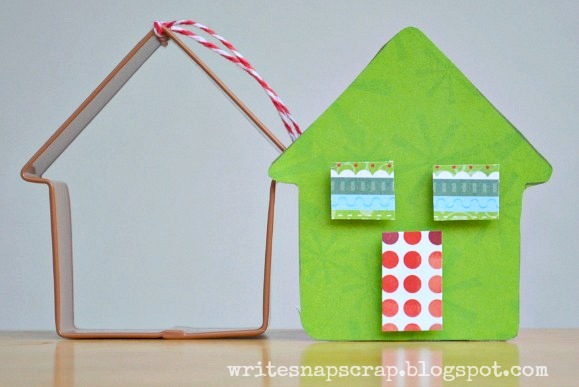 Before you start decorating the cookie cutter, think about how you want to attach a hanger. 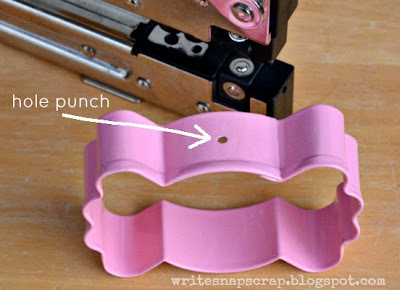 If you have a strong hole puncher like a Cropadile, you can punch a hole in the top, then thread in twine for a hanger. 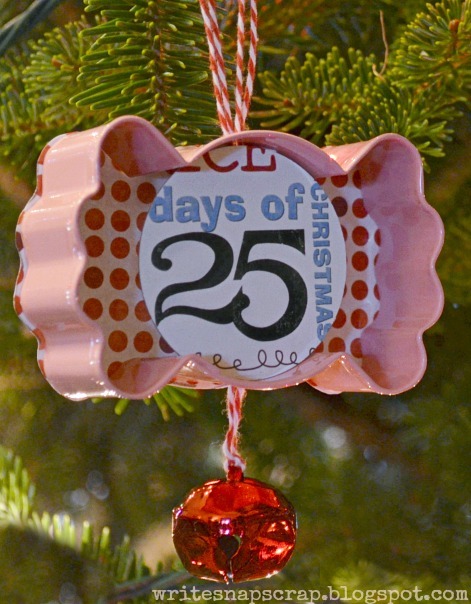 Otherwise, you can just tie twine around the top of the ornament. Either way works well. On this ornament, I punched a hole at both the top and bottom of the ornament and ran twine through both holes with a jingle bell anchoring the bottom. I used baker's twine from Trendy Twine. On this ornament, I traced the house shape, then pop-dotted the windows and doors. It's important to add dimensional elements prior to putting the paper on the back of the cookie cutter. Once the paper is glued on, it is really tight to work inside the ornament. 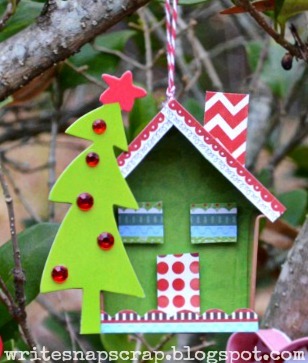 To finish this ornament, I added a roof line, chimney, scallop trim and a tree. 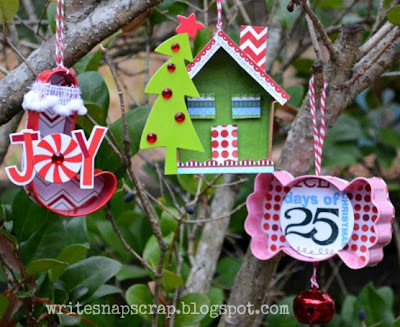 Decorating both inside and outside the cookie cutter gives a nice dimension. I hung these outside to show them in natural light. And they look so pretty on the tree. 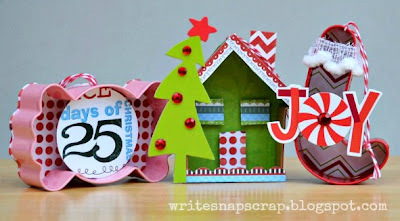 The design team at My Creative Scrapbook has tips and tutorials for the holidays every day this month on the MCS blog. Thanks for stopping by! oh izzy these arew so darn cute!! Great idea! Love the added, extra embellies! awww... these are SO cute and just adorable!!! OMYGOSH!! These are ADORABLE!!! Love love love!!!!!! So incredibly cute! I love the candy cane as a stocking! How adorable are these!!!! CUTENESS. Love those cookie cutter ornaments! Adorable! 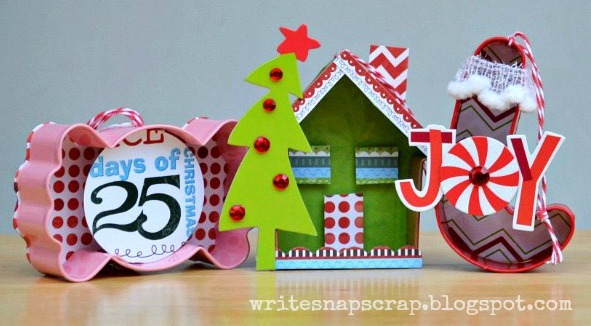 What a great idea!Super cute!